Vaishnavi Sanga - A Spiritual Course for Women! ~ The Toronto Hare Krishna Temple! Vaishnavi Sanga - A Spiritual Course for Women! "Vaishnavi" means a female devotee of Krishna. "Sanga" refers to the spiritual discussions between devotees. 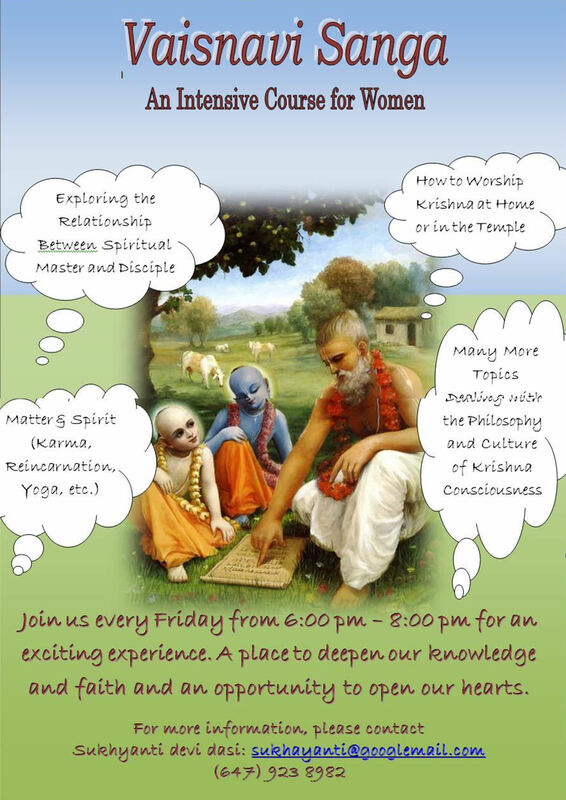 Toronto's Hare Krishna temple is very excited to present "Vaishnavi Sanga - A Spiritual Course for Women", scheduled to take place every Friday evening, starting at 6:00pm. The event will take a form of a weekly retreat in our beautiful Hare Krishna Centre! What a great opportunity to get together and open our hearts while discussing various spiritual topics like exploring the relationship between spiritual master and disciple, learning how to worship Krishna at home or in the temple, learning about matter and spirit (karma, reincarnation, yoga, etc) and many more topics dealing with the philosophy and culture of Krishna Consciousness. Please feel free to bring your friends and family (women only) who can benefit from this amazing spiritual experience! 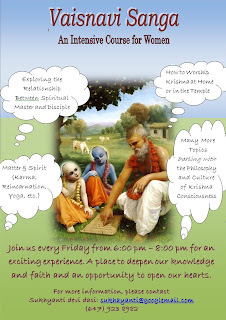 Please join us every Friday from 6:00pm – 8:00pm for an exciting experience.